The Rest of Us Just Live Here cover revealed! I fell in love with Patrick Ness when I read The Crane Wife last year, and feel even deeper in love when I read More Than This which was a stunning read! Bear with me, I haven't mentioned the Choas Walking books, because I haven't read them. Please don't shoot me, I'm well aware that I am missing out and I am hoping to rectify that this year and read the trilogy. 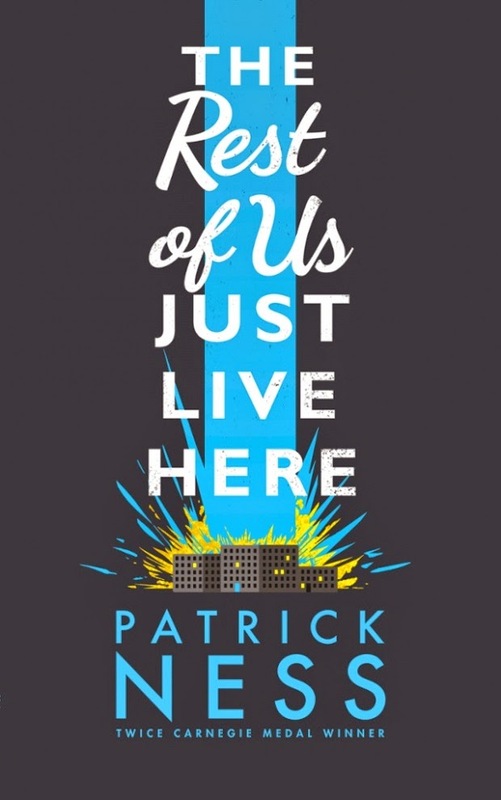 However we have new Patrick to look forward to this year with the release of The Rest of Us Just Live Here in August! And now it has a beautiful cover for us to oggle and I am in LOVE!!! OH MAN JUST GIVE IT TO ME NOW!!! "What if you weren’t the Chosen One? What if you’re not the one who’s so often the hero in YA fiction; who’s supposed to fight the zombies, or the soul-eating ghosts, or whatever this new thing is, with the blue lights and the death? What if you were like Mikey? Who just wants to graduate and go to prom and maybe finally work up the courage to ask Henna out before someone goes and blows up the high school. Again. Because sometimes there are problems bigger than this week’s end of the world and sometimes you just have to find the extraordinary in your ordinary life. Even if your best friend might just be the God of mountain lions..."
Official synopsis: "Theodore Finch is fascinated by death, and he constantly thinks of ways he might kill himself. But each time, something good, no matter how small, stops him. 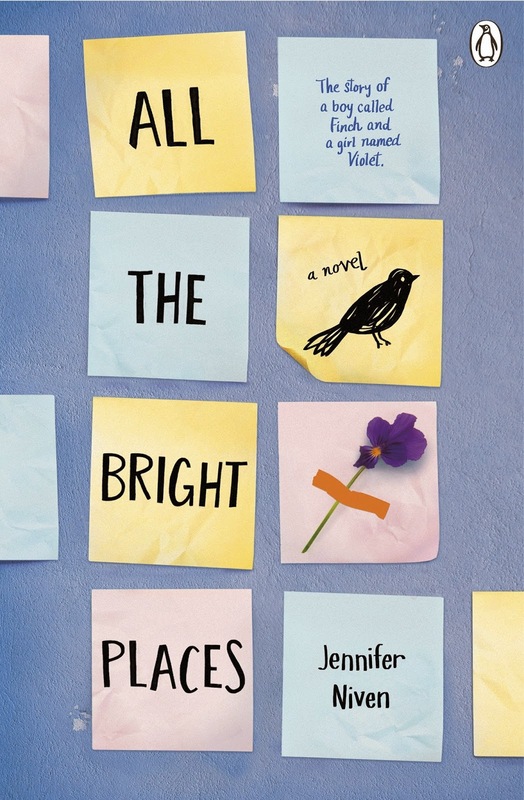 Violet Markey lives for the future, counting the days until graduation, when she can escape her Indiana town and her aching grief in the wake of her sister’s recent death. When Finch and Violet meet on the ledge of the bell tower at school, it’s unclear who saves whom. And when they pair up on a project to discover the “natural wonders” of their state, both Finch and Violet make more important discoveries: It’s only with Violet that Finch can be himself—a weird, funny, live-out-loud guy who’s not such a freak after all. And it’s only with Finch that Violet can forget to count away the days and start living them. But as Violet’s world grows, Finch’s begins to shrink." From the first moment that I heard about this book, in an email from Carolyn at Puffin, that I knew I had to read it and I also had an inkling that it would either be a book I would totally adore or one that I hated. It sounds amazing, don't get me wrong... But a kid who is fascinated with his own mortality and wanting to kill himself... I just didn't know how I would feel reading a whole book like that or even if I would be able to make it all the way through. Yeah, the packaging is pretty but what about the contents? I have to say that my concerns were ill-conceived and the book itself is, in fact, an absolute masterpiece. A stroke of genius. It's wonderfully, beautifully, written. It's evocative and thought-provoking and had me questioning so many things, aspects, of my own life and the people around me. From the second I started reading I was so engrossed in Finch and Violet, in their blossoming relationship and the way they are perceived by those around them. This is the sort of life-consuming read that completely takes over your life. I could not stop reading and at one point crying! It's emotional and so charged that I still, a few weeks after reading it, feel deeply affected. As someone who has had to deal with issues on a similar (although not as drastic, I might add) scale, the book felt incredibly real and raw to me. I felt like it was talking directly to me, that Finch was talking to me, that Violet was sharing herself with me. The book deals so well with mental health issues, suicide and the grief that follows the death of a loved one. It covers a whole range of emotions and at times left me breathless as I recalled thoughts and feelings I had had - thoughts and feelings that had made me feel so alone but I now know are shared the world over, and this book was the key to that. I am not normally a fan of a two-narrative driven story. I don't think they work that well most of the time, but when it is right, it's right. And fortunately with All The Bright Places, it most certainly is right. Finch and Violet both have such distinct voices that there is no confusing one for the other. They both feel so fleshed out. I really liked how they came to know each other so well because they both had the same intention before Finch talks Violet out of doing what she was intending. But because Finch is the school clown, mocked and laughed at, of course the story is given a completely different spin and as far as their fellow pupils are concerned, Violet has just saved his life, not the other way round like it really was. It is this chance encounter that brings them closer, starting a relationship based on exploration, one that is about finding the happier moments in life. Ultimately, the ending was very unexpected for me. I didn't think it would end the way it would, but it left me in absolute pieces. Really, I was ruined when I finished the book, I turned over the page and almost yelled, demanding more. I needed more. It couldn't end there, there had to be another part somewhere and my copy had been misprinted? It had to be. That to me is the sign of a good book, when you're gasping for more, even when all the plot lines have been tied together into a neat ending, and you still want more. Even if it's mundane, so far removed from the book, you just want more. This book would be perfect for people that liked The Fault in Our Stars, or just for anyone who needs a little enlightenment in their life. Honestly, please just pick this book up. It is a life-changing experience that you should not miss out on. My thanks to Carolyn at Puffin for my copy - I will cherish it for years to come! Thank you! I can't believe it. I genuinely can't. When I set up my blog all those years ago I never dreamt it would still be a thing I did and thought about. I started it just for a bit of fun after discovering that book blogs existed. I don't even know how I came to realise this but I know the first one I ever found was Jenny's incredible Wondrous Reads site. Since then I've gotten to speak to so many amazing people, and even got to go to a film premiere because of it, which is something I never imagined would happen (although I haven't met anyone yet... which is s0 FRUSTRATING!!!!). The past few years have been pretty hectic and I always completely forget about my blogiversary and will just happen to realise that is has already passed so I cannot do anything to celebrate... Well not this year! As a massive thank you to each and every one of you out there that has supported me, read the blog, follows me on twitter and instagram, and to all the amazing publishers and publicists and their amazing authors, I am running this give away! Wahoo! I've always wanted to do one but I wanted a good reason and my blog turning 5 seems like a good idea to me. And what is better is that it is an INTERNATIONAL giveaway! As long as the Book Depository ship to your country then you can enter! Fantastic stuff! Yo can find a list here of all the countries they ship to! All you have to do to win is fill out the form below. It's as simple as that! No tricky questions, nothing major. Just fill out the form and sit back and wait! What I have decided to do is pick five of my favourite books I have reviewed. One from each year I have been blogging... So, here are the choices! 2010: When I Was Joe by Keren David. 2011: A Monster Calls by Patrick Ness. 2012: Gods and Warriors/The Outsiders by Michelle Paver. 2013: Two Boys Kissing by David Levithan. 2014: This Book Is Gay by James Dawson. Now I am going to have 3 winners who each get to pick one book and then I will also pick out a wildcard entry who will win all 5! Now, the competition is open until 11:59pm on 6th March and winners will be picked some time that week and contacted for their addresses so I can send their prizes out! Good luck to everyone, and thank you for an amazing five years! 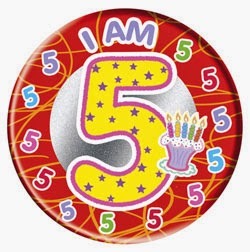 Here's to another 5! 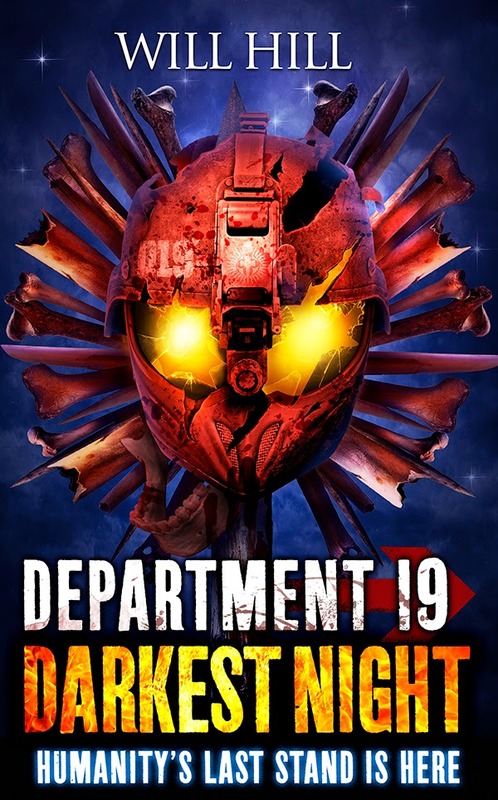 If you have been around the past few years there you will have definitely heard me and several other bloggers babble on about how amazing Will Hill and his Department 19 series is. Well, 2015 sees this epic saga come to a conclusion with the publication of the fifth and final book, Darkest Night. I for one am incredibly excited but also excuciatingly scared. I have even put off reading book 4, Zero Hour because I don't want the series to end and I want to make the wait between the two books as short as possible as I have heard that the ending of Zero Hour leaves readers gasping for more and knowing Will and his cliffhangers I am not sure I could cope with it all. That said I am so excited to see how everything wraps up. It has been building up so well and Will is a masterful storyteller! Well, now, the cover for the final book has been unveiled and it is an absolute stunner. ARGHHHHH!!!!! The colours! The bones!!!! Everything!!!! Oh god!!!! It's incredible and I love it. It matches so well with the rest of the series! It's out in June I believe and I can't wait to see what happens!! !